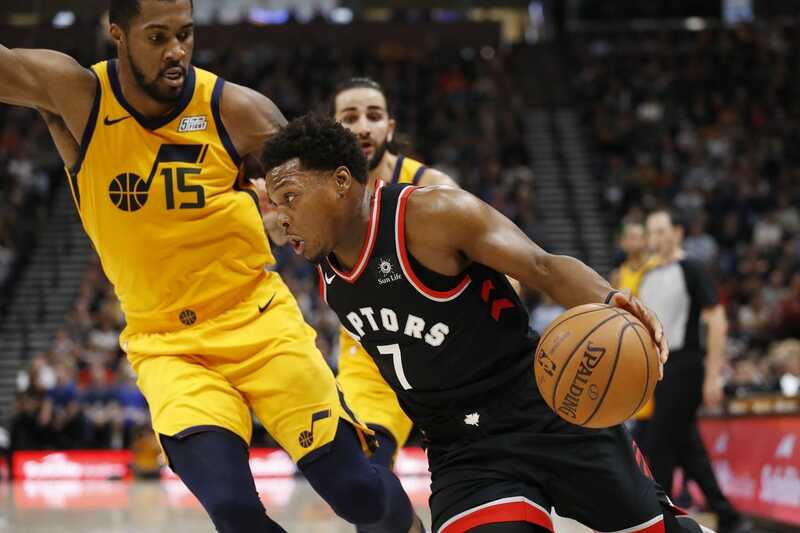 Kyle Lowry scored 17 points, dished out 11 assists and collected seven rebounds to lead the Toronto Raptors to a 124-111 victory over the host Utah Jazz on Monday night. Three other Raptors players also scored 17 points -- led by Serge Ibaka, who came off the bench to make all eight of his shot attempts before fouling out early in the fourth quarter. Alec Burks led Utah with 22 points off the bench in his first game back after missing four games with a left-hand chip fracture. Rudy Gobert added 14 points and 12 rebounds for the Jazz. Utah played without Donovan Mitchell for the second time in three games. Mitchell was sidelined with a sprained ankle. Toronto played without Kawhi Leonard for the second consecutive game. Leonard was sidelined with a jammed foot. The Jazz fell to 0-4 at home for the first time since the 1974-75 season -- the inaugural season for the relocated NBA franchise. It is Utah's first four-game losing streak at home since the 2013-14 season. Utah led nearly the entire first quarter. The Jazz jumped out to a 14-5 lead after back-to-back fast-break baskets from Royce O'Neale. The first one came after a blocked shot by Gobert. O'Neale scored the second after stripping the ball from OG Anunoby. Toronto briefly inched in front 21-20 on a 9-0 run fueled by a pair of baskets from Ibaka. Utah retook the lead on three free throws from Burks and an alley-oop dunk by Gobert on back-to-back possessions. The Jazz built up a 42-35 lead in the second quarter behind an 8-0 run bookended by a layup and a dunk from Burks. Toronto overtook Utah a second time before halftime. The Raptors outscored the Jazz 20-6 over the final 4:48 of the second quarter. Lowry capped the run with a pull-up 3-pointer to give Toronto a 65-54 lead going into the locker room. The Raptors shot 63.4 percent (26-of-41) from the field in the first half -- including 8-of-17 on 3-pointers. Once on top, Toronto kept building momentum and the lead throughout the third quarter. The Raptors led by as many as 24 points in the third quarter, going up 94-70 on a pair of free throws from Lowry with 1:45 left in the quarter.